Popcorn is one of my favorite foods, it is simple, pure and good. I will have microwave popcorn when I am feeling really lazy, but I always find that making it on the stove is almost always worth the extra effort. Making popcorn on the stove is a bit of a dying art, people are scared of giving it a try. This is a shame though, it is really pretty easy and anyone should be able to pull it off. That said there are a couple of tips and tricks to make a good bowl of stove top popcorn. Heat is your friend. Popcorn pops when the water inside the kernel quickly turns to steam causing the kernel to explode open. Without enough heat it explode as much and the popcorn won’t be as light and crisp. Aim for medium-high heat. You want it to be hot enough to pop the corn, but you don’t want to smoke the oil. You want the oil to be about 400-450 degrees. The burner should be hot enough to get the oil back up to this heat when you add the corn. Use a heavy, covered pot. You want a pot that can store the heat so that when you add the corn it doesn’t cool off too much. You want to use a mild oil with a high smoke point. I love Corn Oil, but peanut and Canola oil also work. You need to leave the lid slightly ajar, you want to let the steam vent. When the kernels pop they let of steam. If the steam doesn’t escape, the popcorn gets chewy. It is best to store the popcorn kernels in your cupboard. You want to try and make sure it doesn’t dry out. You need the water in the kernels to make it pop. For best results, after you open your popcorn bag, always store your popcorn in a glass jar, or some other airtight container. Store it in a cool, dry place, out of direct sunlight. If your popcorn, when you pop it, has a slightly gummy texture or pops up like foam, it might be too moist (by approximately 1%). You can put some kernels on a plate and leave it on your counter for a day, then see if it improves. If your popcorn tastes tough after you pop it (too dry by approximately 1%), it may improve with a little added moisture. The ratio is one teaspoon of water to 1 pound of popcorn. Put it in a glass jar and shake it up. Shake it up at least 2 or 3 times a day for 3 days, then try popping it again. Be sure and shake it up, otherwise the water will stay at the bottom and mold the popcorn. Old Bay – This is my favorite topping, it is spicy and salty and sticks to the popcorn really well. Brewer’s Yeast or Nutritional Yeast – Tastey sort of buttery and it is good for you, it is a little tough to get it too stick though. I have found tossing it with soy sauce makes it stick and tastes good together. They soy can make the popcorn soggy though. Kernel Season’s – They make lots of fun flavors. So far I like Naco Cheese the best. Use a heavy pot that can hold the heat. Everyone has their own favorite popcorn toppings, but here are a few of mine. Also if you ware going to add salt, try adding it when you add the corn to the oil, it will help it get even coverage. Wait for test kernels to pop. After they pop, add all the remaining popcorn. Leave the lid slightly ajar. Shake the pot every 10 to 20 seconds to keep the kernels from burning. The kernels should starting popping slowly and then quicker and quicker. When things are popping, lift the lid two or three times to make sure the steam is venting, watch out for flying popcorn! Pour half the popcorn into a bowl, sprinkle some of the topping on the bowl and shake. Pour the remaining popcorn in the bowl and add more seasoning. How do I keep from getting tough popcorn when I pop it on the stove. We use a whirly pop popper, 2 tbsp coconut oil,cook over med high heat…. 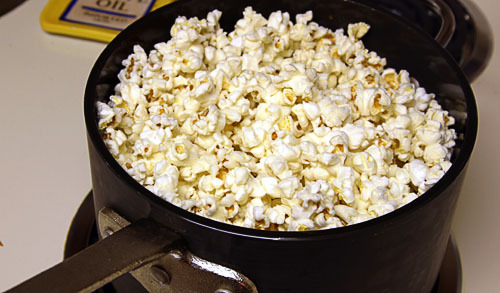 I use a frying pan splatter guard (the circular screen type) as the lid to keep popcorn in and steam out. I cook it in olive oil & cover it with a perforated colander to vent the steam & keep the corn contained. I flavor it with olive oil instead of butter, add some fresh ground pepper with the salt. Brewer’s yeast is not the same as nutritional yeast! Nutritional yeast can be found in health food stores as yellow flakes or a yellow powder, it has a nutty “cheesy” taste, so so so good on popcorn after you’ve put the butter on. Hi Jen, I just popped up a bowl tonight. I am still way addicted to popcorn. I follow you seasoning technique, or sometimes I quickly move the popcorn to a big bowl so I can toss everything. You are right on though, I think the bonus oil helps everything stick. If you are really hooked, check out http://www.kernelseasons.com They have tons of great popcorn seasonings! Anyone have any idea how many calories and fat grams stovetop popcorn has (after it’s popped)? I LOVE the stuff, but I was wondering how it fit into my wieght watchers plan. Sometimes, after popping’s done, i add the seasoning to them while they are still in the pot (move it to a cold burner) because, i believe the heat in the pot will help to make the seasoning stick. My other suggestion is to make sure there is more oil in the pan than there are kernels so that some oil will be left over, and help to serve as a “seasoning sticker” if you will…. Can you tell I’ve given this too much thought? I totally agree about stove-popped popcorn – so much better than microwaved (although, I do get lazy at times, too.) And I have to second the adding salt when you add the kernals to the oil. Best way to get it to stick.